Aldeen Davis, Pres. 603 West Sixth St. Latricia King, Vice-Pres. Muscatine Federated Women's Club Muscatine, Iowa 52761 Nov. 1-70' It is with great pleasure that we add our good wishes to this happy occasion. It has been common knowledge tha Miss Cooper is interested in women's liberation and our place in society long befor the 70's. In 1958 at her home the Davenport Federated Womens club, the Sempar Fedalis, was organized. 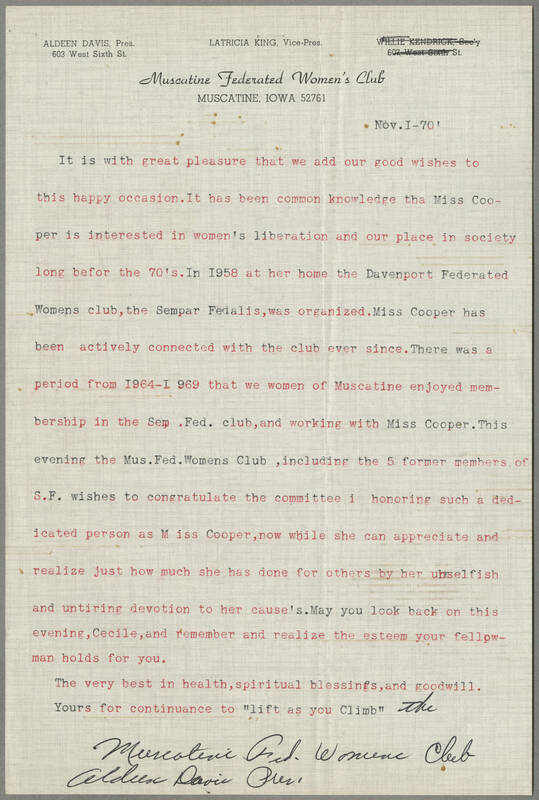 Miss Cooper has been actively connected with the club ever since. There was a period from 1954-1969 that we women of Muscatine enjoyed membership in the Sep. Fed. club, and working with Miss Cooper. This evening the Mus. Fed. Womens Club, including the 5 former members of S.F. wishes to congratulate the committee i honoring such a dedicated person as Miss Cooper, now while she can appreciate and realize just how much she has done for others by her unselfish and untiring devotion to her cause's. May you look back on this evening, Cecile, and remember and realize the esteem your fellowman holds for you. The very best in health, spiritual blessings, and goodwill. Yours for continuance to "life as you Climb" the Muscatine Fed. Women Club Aldeen Davis Pres.